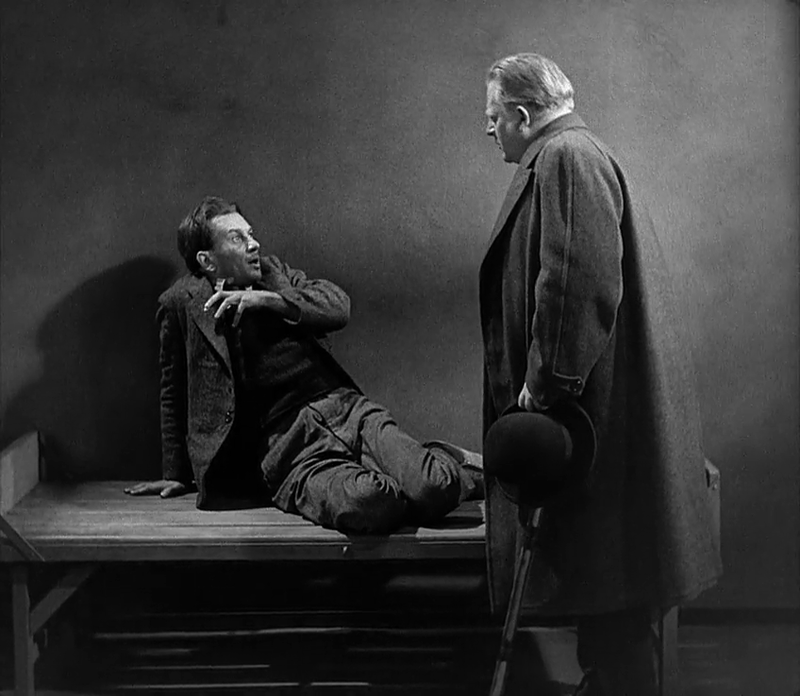 The evil crime genius Dr. Mabuse has been locked up in an asylum for years. And yet, there are rumours that his band of criminals is again operative, and they commit crimes that seem strangely similar to Mabuse’s old modus operandi. In Das Testament des Dr. Mabuse (The Testament of Dr. Mabuse), Fritz Lang’s master criminal from the previous film Dr. Mabuse, der Spieler (1922) is set against Inspector Lohmann, previously seen in yet another Lang classic, M – eine Stadt sucht einen Mörder (1931). And we, the audience, are in for a treat. 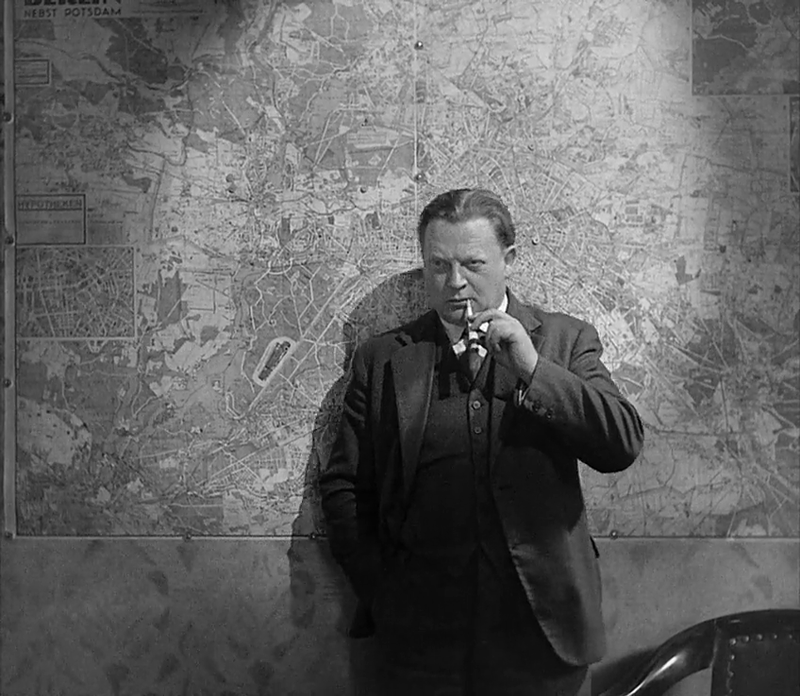 Das Testament des Dr. Mabuse was the last of Fritz Lang’s long line of classic masterworks. Lang had directed films since the late 1910s, and starting with his first Mabuse film, Dr. Mabuse, der Spieler (1922), every film he made for the next decade was destined to become one of the great classics of cinema and extremely influential upon future film makers. After 1933, Lang continued to make competent films, such as Scarlet Street (1945), but none were as groundbreaking or brilliant as his earlier works. Two things happened after completing Testament that may have caused Lang’s filmmaking to take a new direction. First he separated from his wife, Thea von Harbou. She had cooperated with him throughout his greatest period, mainly doing the writing of the films. I do not know enough to say how the separation may have effected Lang, but just by looking at all the great films they made together, I think it is safe to say that her impact upon his films must have been considerable. The second event was that Lang wisely decided to leave Germany to avoid the Nazis. Hitler came to power earlier the same year that Das Testament des Dr. Mabuse premiered, and there are apparently many small critical references to the Nazis woven into the dialogue of the film (though I will happily admit that, not knowing I aught to look for them, I missed them all when I saw the film). This film is best enjoyed if you are prepared for Lang’s somewhat different visual and narrative style. Das Testament des Dr. Mabuse is in many ways closer to the 1920s than contemporary films from other parts of the world, and if you are used to film from the 1940s on, you may actually feel more comfortable watching one of Lang’s Hollywood productions. 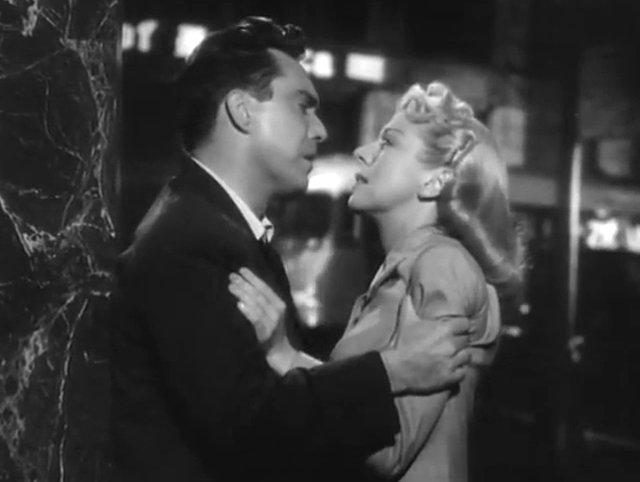 As the 1940s turned into the 1950s, things happened with the film noir genre. It has something to do with the lighting, and with the camera angles. Perhaps there is something about the plots as well. 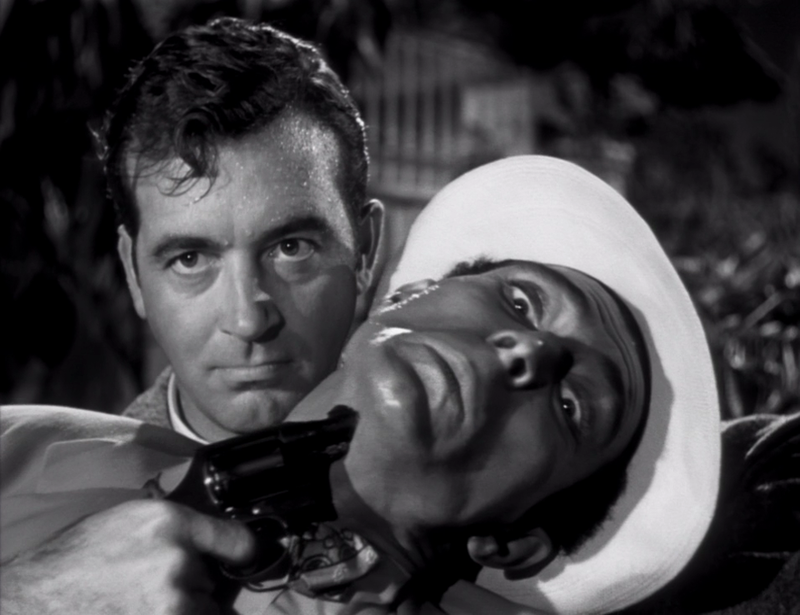 Anyhow, a good example of this “new wave” of noirs is Kansas City Confidential. 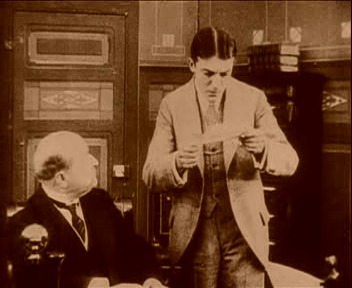 The plot is superficially similar to one of Alfred Hitchcock’s favourites, where a man is falsely accused of a crime and has to clear himself of suspcion. In this case, however, the plot is twisted in several ways, not least because the accused is an old jail bird, and there really is no-one in the film who has an entirely clean consciousness. Well, except maybe Coleen Gray in the role of the romantic interest, although as a woman studying at law school, that role is interesting for being representative of the growing women’s rights movement. There are quite a few films with the word “Confidential” in the title, but as far as I have been able to figure out, Kansas City Confidential may have been the first with a city name in the title. It must have been fairly popular, because Chicago Confidential, New York Confidential and others like it followed within the next few years. This film is best enjoyed for the good actors and the wonderful characters. The plot is a bit weak at times, but those characters, along with solid directing, more than make up for that. Life is tough for Frank Bigelow. Not only is he uncertain about his feelings for his girlfriend and secretary Paula, but he is also dying after having been poisoned by a radioactive substance slipped into his drink. The film D.O.A. begins famously with a long tracking shot as we follow Bigelow into the police station where he goes to report the murder of himself. The rest of the film is one long flashback, explaining all about how he came into such circumstances. The abbreviation DOA stands for “dead on arrival”, and that is basically what Bigelow is as he enters that police station. This gives the whole film a sense of impending doom, one which is strengthened by the protagonist’s clothes. From the beginning of the film to its very end, Bigelow wears the same elegant double-breasted suit. Only, the further the film progresses, the more beat up Bigelow gets, and the suit with him. In addition to its many other good qualities, D.O.A. is gifted with an abundance of quirky personalities. Frank Bigelow himself is certainly among these, and in many ways he fits the archetypal cynical noir “hero”. About the only sane person in the entire film appears to be his sweetheart Paula. This film is best enjoyed if you like a good story with lots of nice and unexpected twists. This one has them in abundance, even for a film noir. Sure, it may be a little improbable at times, but that is easily forgotten and forgiven. When I think about Frank Sinatra, I think about him as a singer. 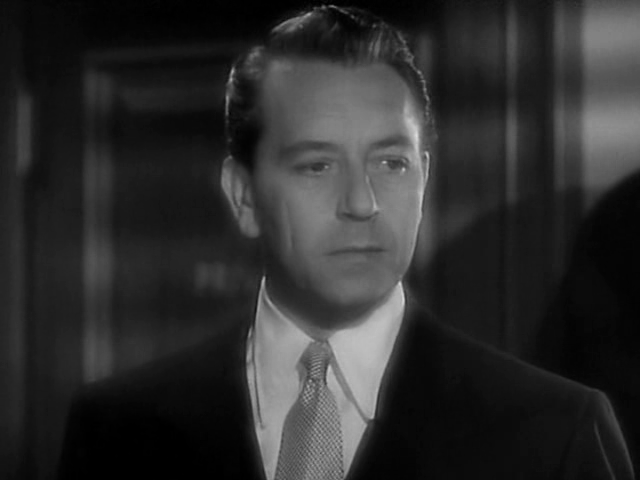 But he also acted in dozens of films, mostly during the 1950s and 1960s, and he was not a half bad actor. Today, his acting is perhaps best remembered for roles in classics such as From Here to Eternity (1953), Ocean’s Eleven (the 1960 original) and The Manchurian Candidate (1962). But he made many other memorable performances, not least so in Suddenly. 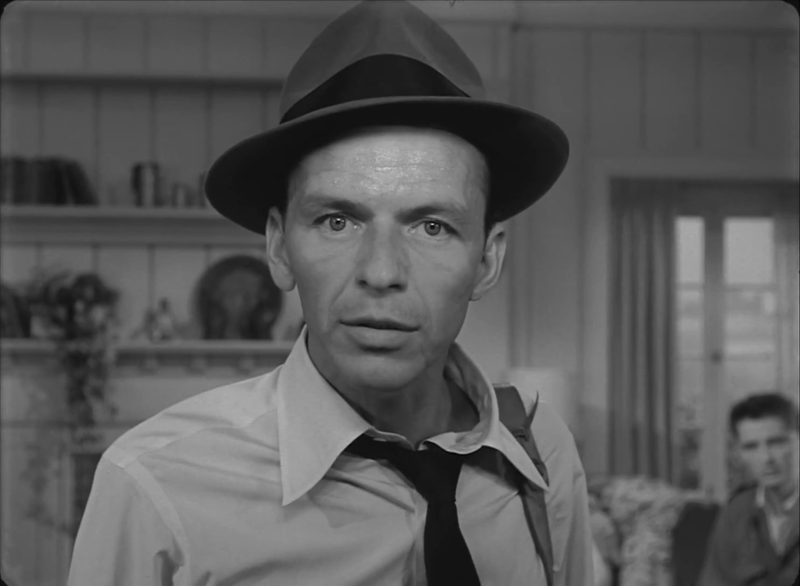 Here, we see Sinatra as a cynic war hero who has turned into an assassin, taking money for doing what he does best – killing people. He has taken on the job of shooting the president of the United States, and decided to do so in a small town named Suddenly. There his chosen firing position forces him into a close encounter with the local sheriff and the sheriff’s sweetheart, the widowed Mrs. Benson who lives with her father-in-law and her son. During the first part of the film, the acting feels a bit stiff, especially by Stirling Hayden, who plays Sinatra’s nemesis, the sheriff. Hayden was an excellent actor, and the stiffness was no doubt deliberate on his part. He must have wanted to create a slightly boring but totally dependable and patriotic hero, just what American movie-goers needed at a time when the world seemed a very dangerous place to live, and the president was much more of a symbol for the entire nation than is perhaps the case today. Suddenly was remade in 2013 by Uwe Boll, but the remake is said to be far inferior to the original. This film is best enjoyed when you understand some of the political undercurrents of the time. The moral message of this film is perfectly clear: Unless you have a bigger gun than your enemy, and unless you are prepared to use it, he is going to make you suffer. In that respect, you can see this film as a metaphor for the entire Cold War. 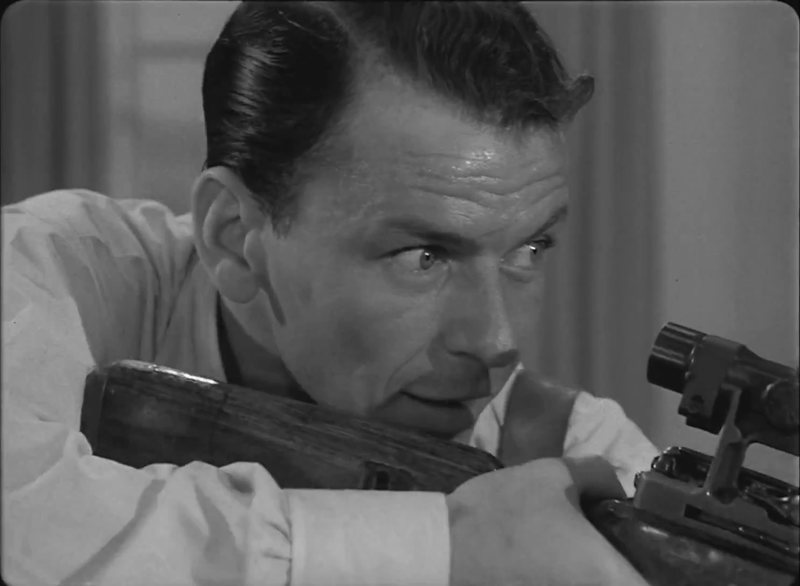 Sinatra and his gang represent the communists, and his sniper rifle represents their nuclear arsenal. It is a good thing there were still righteous Americans around in the 1950s. I have previously written about a number of serials. Looking at those earlier reviews, one might easily get the impression that serials were mostly a sound film phenomenon. Ah, but nothing could be further from the truth. It has proven difficult to find reliable facts about silent serials, but the first ones seem to have appeared as early as the first decade of the 20th Century. By 1915, production was in full swing, on both sides of the Atlantic, and before the era came to an end around 1930, hundreds of silent serials had been made. I am guessing that many are incomplete or lost today, but many others survive, and the best are quite up to the standards of the so-called “Golden Age” serials of the 1930s and 1940s. They were not yet as clichéd and predictable as the later serials usually were, and quite often they created the elements that were later to become cliché. The French serial Les Vampires (episodes 1, 2, 3, 4, 5, 6, 7, 8, 9, 10) is often considered to be among the best of those early ones, and indeed some claim that it is one of the best serials of all time. It tells the story of how newspaper reporter Philippe Guérande tries to thwart a group of criminals who terrorize Paris. In spite of the title, Les Vampires has nothing to do with any vampires. It was simply the name that this gang of criminals used for themselves. The plot, meandering in various directions, is a bit too complex to summarize here, but it is impossible to review this serial and not mention the character Irma Vep (note the anagram), who makes her first appearance in Episode 3. Vep is a close associate to the leader of The Vampires. She is totally unscrupulous and a master of disguise, and for the rest of the serial, she remains the main antagonist. Irma Vep has certainly been one of the strongest cultural footprints of Les Vampires. She remains a popular character and icon among silent movie fans. According to Wikipedia, Les Vampires was made “quickly and inexpensively with very little written script.” Well, that shows, and the plot seems pretty random and incoherent at times. I know that some people have a problem with that, but I do not find that it detracts from my enjoyment. There is so much to like about this serial that some small rough spots are easily overlooked. Besides, modern Hollywood scripts are not always too coherent either. This serial is best enjoyed because of the huge influence it has had on later crime cinema. Among the film makers said to be strongly inspired by it are such giants as Fritz Lang and Alfred Hitchcock. There are good reasons why this particular serial became so influential. Watch it and find out for yourself! An agent for a war crimes commission decides, in desperation, to let a German war criminal out of prison in the hopes that he may lead them to another German who committed atrocious acts against humanity during World War II. This other German is suspected to hide under assumed identity somewhere in the United States. He must be found before he can commit new crimes. Thus begins Orson Welles’ The Stranger, a film where Welles both played one of the leading roles (the German in hiding) and directed. It is one of rather few Orson Welles films that can be found at the Internet Archive, and for that reason alone deserves our attention. 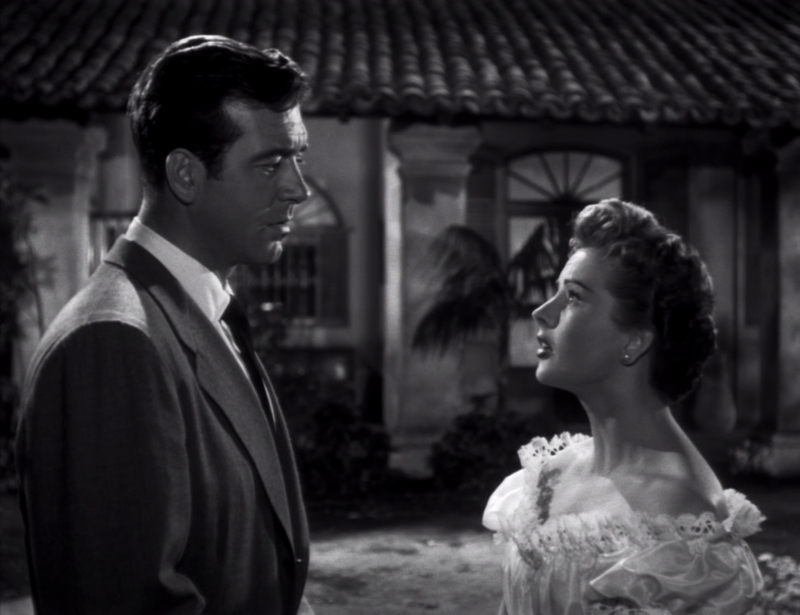 This is a typical film noir in many ways, such as its dramatic camera angles and lighting, and also the script which is full of cynism and human evil. The version of the film I link to here is an excellent quality MPEG4. If you strive for nothing short of perfection, then there is also a Matroska copy made from the same source, but it is almost five times as large, and I doubt if you will notice the difference. This film is best enjoyed for Orson Welles, even though many of the supporting cast are also very good. 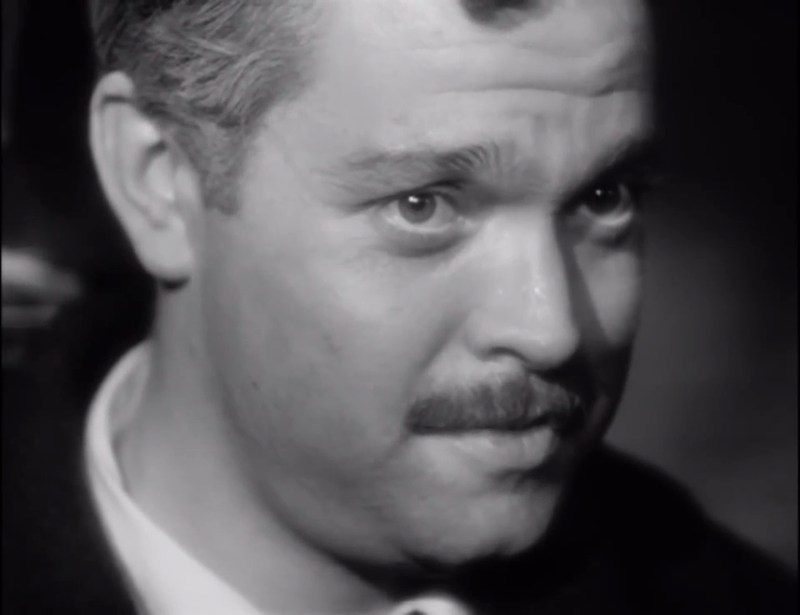 Welles is, as always, excellent in his acting as well as in his directing. And if the plot happens to be just a bit too improbable for this to be any of Welles’ best films, then that just goes to show that this film is a child of its time. 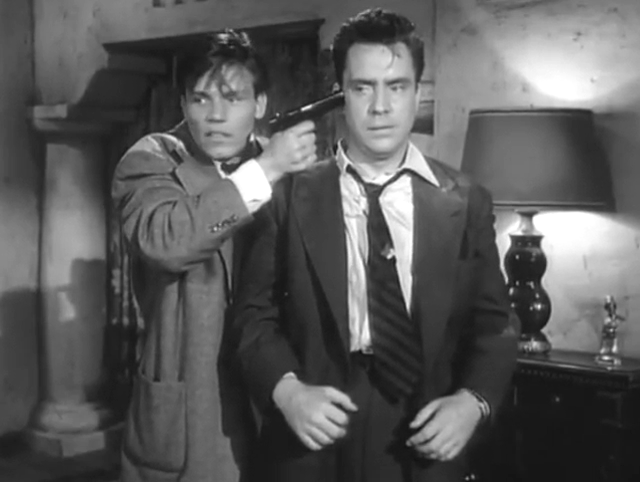 There are several very good film noirs at the Internet Archive. Since I have previously only written about five of them, the latest over a year ago – the “historical noir thriller” The Black Book, which is not exactly a “pure” noir – it is about time for another. The turn has therefore come to the exellent The Scar, originally titled Hollow Triumph. When John Muller is released from prison, he and his companions decide to rob a casino. The heist goes awry, however, and he is now a wanted man. The casino owner wants to get even. In a stroke of good luck, Muller meets a psychoanalyst who is his doppelgänger, except for a large scar on one cheek. He decides to take over the man’s identity in order to disappear from his hunters. But this is a noir. Things are bound to go wrong somehow. Just like any good example of the genre, this film is ripe with suspense and drama. The minds of most people who populate its black-and-white world are as dark as the dramatic shadows falling across the screen. The actors are really good, too, so even though the plot has some not so brilliant moments, this is not to be missed if you are a fan of the genre. This film is best enjoyed whenever you need something to make you happy. 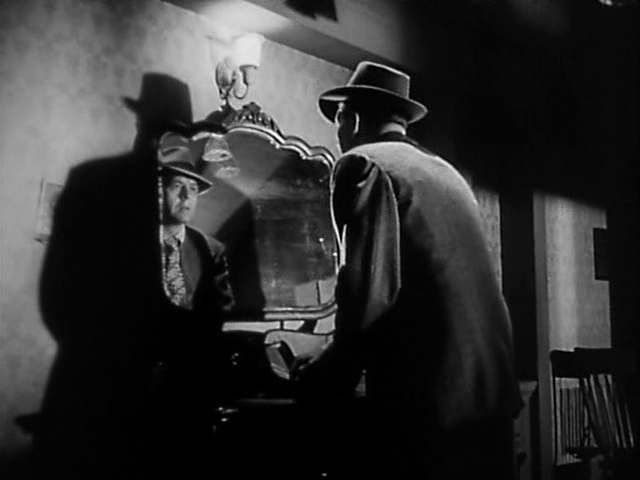 Even though film noir tend to be pretty downbeat in many ways, they never fail to improve my mood.